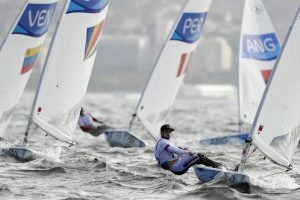 RIO DE JANEIRO – Sailing, not the dirty water, was finally the focus on troubled Guanabara Bay during a spectacular start to the Olympic regatta. Windsurfers sped across the waves toward Flamengo Beach in a fresh breeze, against the imposing backdrop of Sugarloaf Mountain. Christ the Redeemer, Rio’s highest and most magnificent landmark, was obscured by fog. Across the bay, 43-year-old Robert Scheidt won the second race in the Laser class after finishing a disappointing 23rd in the opener. He’s trying to become the first Olympic sailor and first Brazilian to win six Olympic medals. He owns two golds, two silvers and a bronze. He’s seventh overall. Buckingham finished 20th and seventh in the two races Monday, with eight races to go before the medal race. Guanabara Bay seemed to pass the sniff test, at least on the surface. The courses appeared clear of trash. Organizers have sent a helicopter over the bay every morning searching for rubbish. If any is spotted, boats are sent to scoop it up. Barriers have been put across rivers to try to stem the flow of garbage into the bay. Under the waves, things are different. “This is like perfect conditions. You can’t get better than this. And the views are amazing,” said American windsurfer Pedro Pascual of Miami. Conditions could change if it rains. Pastor said he’s not afraid of swallowing the water. Croatia’s Tonci Stipanovic led the Laser class while China’s Lijia Xu led the Laser Radial. Nick Dempsey of Great Britain and Charline Picon lead the windsurfer classes. Mike Dwight August 9, 2016 Category: Uncategorized.